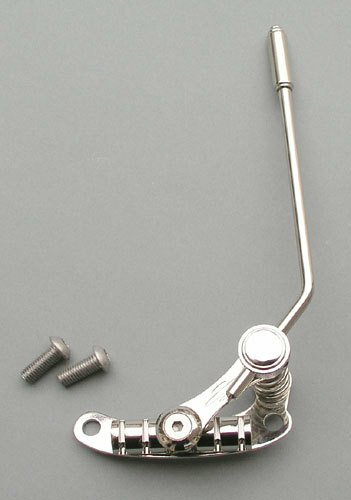 Les Trem 2, Guitar Vibrato from Duesenberg.
" Simple and effective ...."
I'm a guitar novice who likes tinkering with electric guitars. 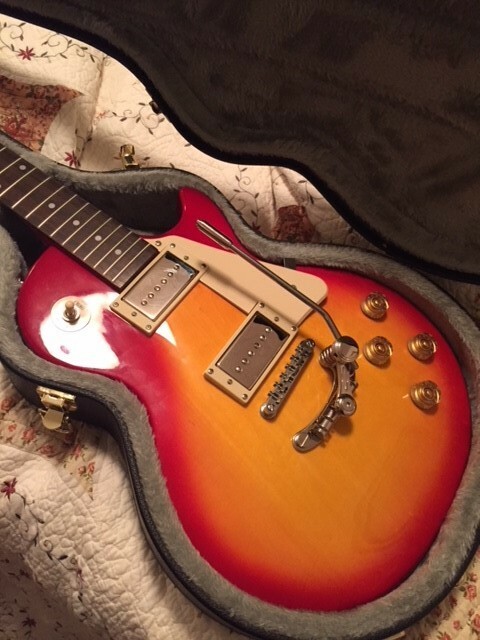 I've been updating aspects of my Epiphone Les Paul 100. 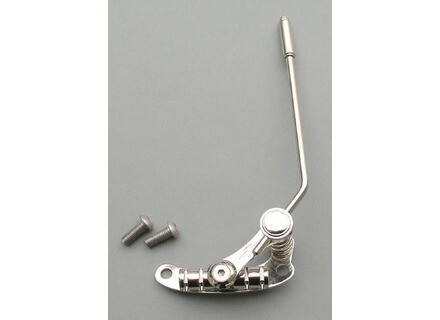 One of the modifications I recently made was the replacement of the factory tail piece with the Duesenberg Les Trem II. This review only covers installation. I haven't strung it yet to play it, and I can't really play, so my opinion in that area wouldn't be worth much anyway. Read the other reviews for comments on usability. I have a right-hand version of the Trem II. After waiting for over a week (internationally, this is probably fairly quick) for my Trem II to arrive from Germany, I was very disappointed that it wasn't going to fit. It was obvious when attempting to screw in the mounting posts that they were going in at an angle and the Trem II holes were slightly two wide for the guitar. The tail piece holes on the 100 were approximately 1-2mm narrower (I didn't actually measure) than the Trem II mounting holes. I read online that someone else had a similar problem and was still able to mount the Trem II by making its mounting holds slightly larger using a Dremmel, but I didn't want to go through all that trouble. I probably would have screwed it up anyway. However, I tried a couple of different approaches, and finally got it mounted. I didn't use the washers, though I don't think that would have mattered either way. First, I screwed in the right post all the way flush, then backed it out 1/2 to 1 revolution. Next, using only my hands (and keeping the left hole lined up horizontally, I pushed the Trem II toward the right as hard as I could with my right hand as I slowly threaded the left post into the tail piece mounting hole using my left hand. It went in at a very slight angle at first, but after a couple of slow resisted turns, I felt the post "pop" (for a lack of a better term) into the post hole. Once this happened, the post was perpendicular and screwed in and out easily. I finished by tightening both mounting posts with a screw driver. The left post hole or post screw might now have a threading issue (but I don't think so), but I don't ever intend to take it off. So if it does, oh well. I realize that there are folks out there that are probably horrified by this technique, but it does appear to be properly aligned and solidly mounted to the guitar with enough surface clearance. I could have knocked off stars because the Trem mounting holes didn't line up with the guitar's tail piece holes, but I didn't because I feel that's probably an Epiphone manufacturing tolerance issue rather than a Duesenberg manufacturing issue. The amount I paid included shipping to the US.